The Cold War, phoney Americans, thoughtful Russians and the game of chess. 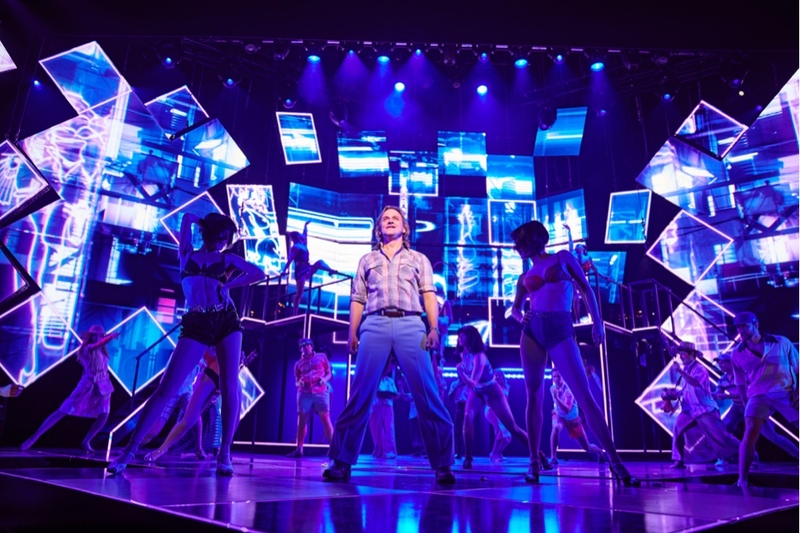 All all backdrops in Chess the musical. It’s a curious rock opera about everyone out to make it on their own. And to hell with anyone who gets in their way. It’s playing a limited run at the home of the English National Opera’s London Coliseum. Written by Tim Rice with music by ABBA’s Benny Anderson and Björn Ulvaeus, maybe it is a show about solitude. Itis a must see for ABBA fans. It allows you to wonder what the band might have sounded like if they carried on into the eighties with its rock ballads and intricate melodies. It’s the first West End production of Chess in 32 years. And while the show has had many changes over the years, it works best when it flashes its early eighties origins. It looks gorgeous with its neon-inspired outlines and large projections. Adding the forces of the English National Opera Orchestra and chorus it sounds sublime. But even paring the story back with minimal dialogue comes with problems. Freddy (Tim Howar) is a chess champion and abuses his assistant, Florence (Cassidy Janson). 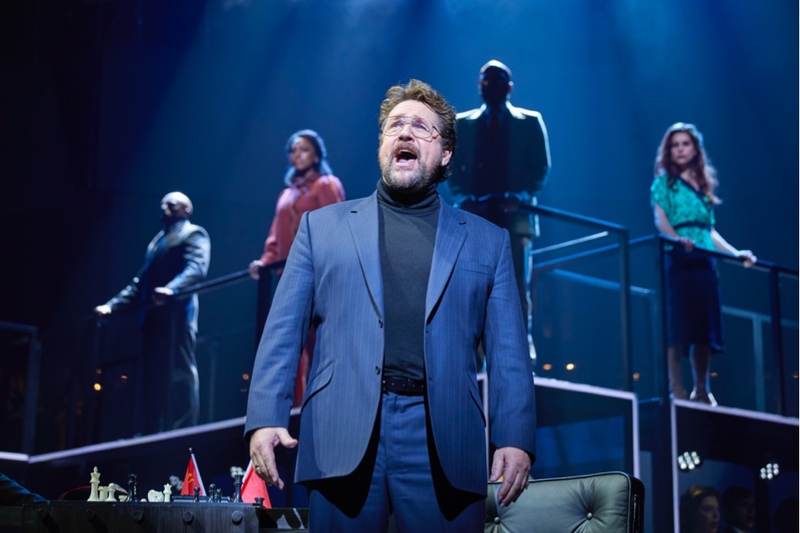 The Russian, Anatoly (Michael Ball) and Florence fall in love over a beer at a mountain bar. Anatoly then leaves his wife (Alexandra Burke) and child, seeks asylum in England and declares he’s a citizen of nowhere. Anatoly then proceeds to spend most of act two disinterested in both Florence and his wife. While Freddy runs about as a Piers Morgan-style journalist. In this context the hit song “I know him so well”, delivered without irony, seems a little odd. It’s hard to care about any of them, let alone know what they’re on about. The lack of chemistry between the performers doesn’t help either. The sound also didn’t always support them. If the microphones weren’t cutting them off (or not coming on), the balance made it hard to hear what they were singing. Much of the show takes place in hotel rooms. The big climactic song, ”Pity the Child” for instance is a strange ballad full of superfluous backstory to Freddy’s character. It also seems to take place in Florence and Anatoly’s hotel room. I was somewhat wishing one of them would burst in and tell him to get out. Afterall the show could do with a bit of humour. Like Candide, it could do with a narrator who could not only explain the story, but remind the audience not take it too seriously either. 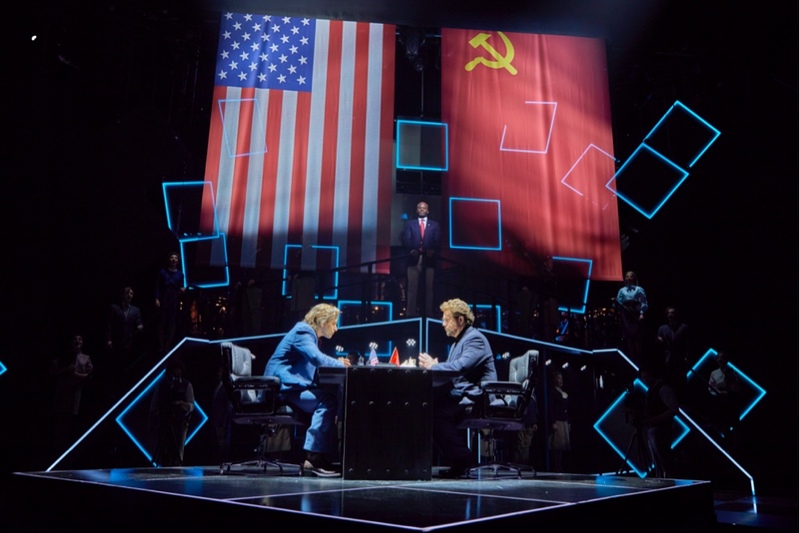 Directed by Laurence Connor, Chess is at the London Coliseum until 2 June.